Well it seems winter is upon us. The rope, quickdraws and harness have now been put in storage for the winter. The van is stacked with bouldering mats and my body is gettin stronger. This must mean it’s time to Boulder in the UK. Over the last 10 month’s it’s been a struggle to get the work/climb balance but recently I have learned that working is good for rest and recovery. And when I finish work late and can’t climb I now go kickboxing to get fitter and strengthen my body. When I can climb it rains so that means one thing go to Boulder UK to train. I have noticed a big difference recently from reducing the amount of time I climb per week. The main thing is that when I climb now, I appreciate it, I appreciate the environment, the rock and make the most of days in and out. This weekend was fantastic conditions so I headed to Robin Hoods Stride and Cratcliffe with a bunch of highly psyched individuals. At one point our party was about 10 strong. I warmed up and I flashed 2 classic v8s Jerrys Traverse and T Crack. I was already happy with climbing for the day. 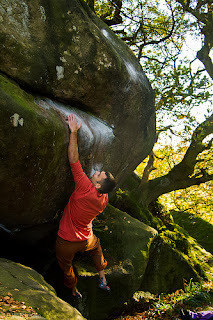 Pete Wilkinson who is a talented boulder and photographer who has come on in the last 2 years smashed up the same doing them second go. We then headed to Robin Hoods Stride ticking most of the classics, Jerrys Arete v6, Cave Problem v6, v7 and generally had a brilliant time.